The chapters in this collection illustrate how current concepts and principles from various disciplines can be viewed from the perspective of their value to educational process thinking. While not providing specific prescriptions for educational problems, the articles provide relevant experimental and theoretical knowledge has accumulated in many fields including learning theory, cognitive development, motivation, and intellectual abilities and attitudes. Contents: W.K. Estes, Learning Theory. G.M. Olson, Intellectual Development. C.S. Dweck, Motivation. J.B. Carroll, Intellectual Abilities and Aptitudes. J.D. Bransford, N.J. Vye, L.T. Adams, G.A. Perfetto, Learning Skills and the Acquisition of Knowledge. J.F. Voss, Problem Solving and the Educational Process. "....[The] authors in this book....have covered education well from the perspective of cognitive psychology. 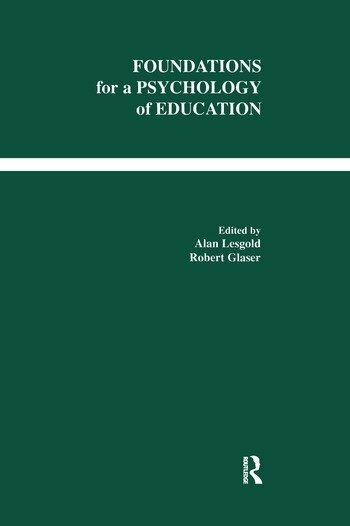 The book is a valuable resource for anyone needing a concise and constructive summary of what cognitive psychology has to say for education."